The nature of the terrain vividly comes to life when orbiter camera images are overlaid on a digital terrain model. 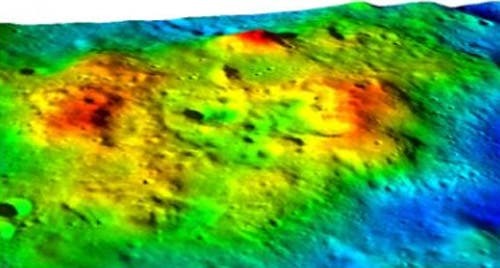 At the center of the province is an irregular depression that might well be a caldera and at its edges are domes with features that suggest they were formed by the intrusion of high-viscosity silicic lava, a type of lava rare on the moon. Any model of the moon's thermal evolution must now be able to account for this volcanic province as well as the familiar mare. According to Joliff, the domes were likely formed by lava which came from within the moon that flowed up through cracks to pool just beneath the moon’s surface, which then pressed out to create them. In 1998, NASA’s Lunar Prospector probe circled the moon’s surface revealing a highly reflective plain lying between two ancient impact craters which is now known as the Compton-Belkovich region.